MEDYADAM provides professional proofreading services to all types of writers, including students, academics, book authors, governments, and businesses. MEDYADAM Proofreading Department employs professional editors worldwide and offers genuine affordability. We employ professional proofreaders and editors worldwide on 55 different languages and dialects. We are meticulous when it comes to editor requirement and all our editors have high-level academic qualifications (many have PhDs and additional qualifications in professional editing), considerable experience as professional editors, and the flexibility to accommodate short turnarounds. 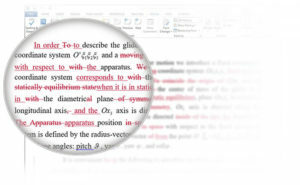 With a large team of professional editors, we have experience in proofreading all types of academic, book, and business documents. Errors and inconsistencies reflect badly on your professionalism and detract from your ability to communicate the intended message. A professional proofreader is far more capable than a layperson in ensuring that your writing is clear, correct and free from error. Our proofreaders are trained to locate and correct errors in written work and to enhance the quality of the documents that they review. At MEDYADAM all our proofreaders are trained editors and have great experience editing academic, book and business writing on 55 languages. To see in which languages we provide proofreading services please visit the page LANGUAGES.